The circus is back they were a huge hit at the 2014 Ōtaki K ite Festival, and they’re back to entertain in 2015. Based in Ōtaki, Fuse Circus is New Zealand’s top circus and physical theatre company. With sell-out shows around the country this summer, the circus returns to Ōtaki to wow the crowds at 4pm each day of the kite festival. Their show on the stage next to the surf club will be a new version of Campground Chaos, a mix of Kiwiana and crazy circus antics. It’s inspired by the classic Kiwi holiday, a tradition of sunburnt pleasure and carefree hijinx in campgrounds, holiday parks and beaches all over New Zealand. Campground Chaos and the lively cast of Fuse Circus will bring you a summer holiday experience you will never forget! The performance had hundreds of families entertained and delighted last year. It was the perfect end to each day of spectacular kite flying. 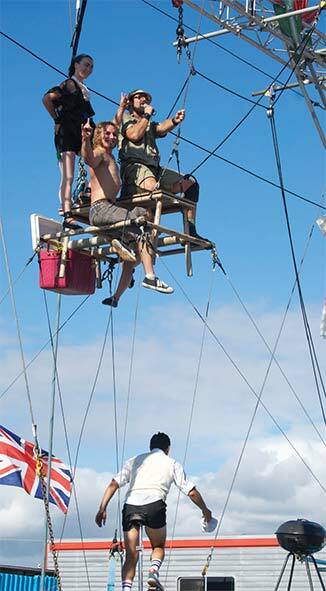 So pack your deck chair and jandals, and hang around for the fabulous Fuse Circus.